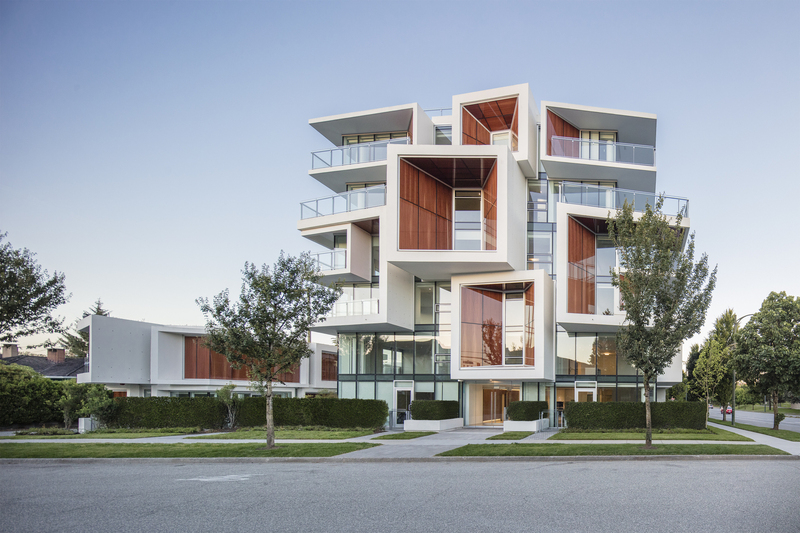 Arno Matis Architecture shines bright with their multi-residential project called Aperture located in Oakridge, Vancouver. The neighbourhood's qualities heavily influenced the characteristics of the project, which is located between a single-family neighbourhood dating from the 1960s and a busy transit station. These two contrasting urban conditions unique to the site influenced the height and massing of the complex, with the transformation from the more urbane six-story midrise into two 3-story villas which compliment the lower density residences. The complex stands out in both uniqueness and it's Avant Garde approach, with careful attention to the play of natural light, which is the basis for its namesake Aperture. 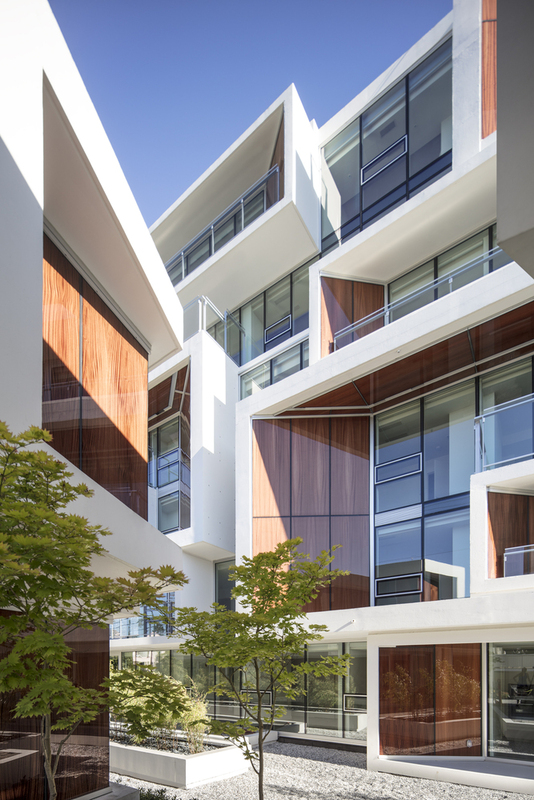 The windows throughout the complex are oriented in certain directions, each with specific depths to create “passive shading”. This fascinating application adjusts the intake of light and exposure into each suite - similar to that of an aperture on a camera - creating the optimal interior setting. On the south elevation, the windows are set deeper to decrease direct sunlight while on the north exposure, they are more shallow and open for more natural lighting. This concept of light manipulation is brilliant! The aesthetic quality is enhanced through the reflection of light in multiple ways. 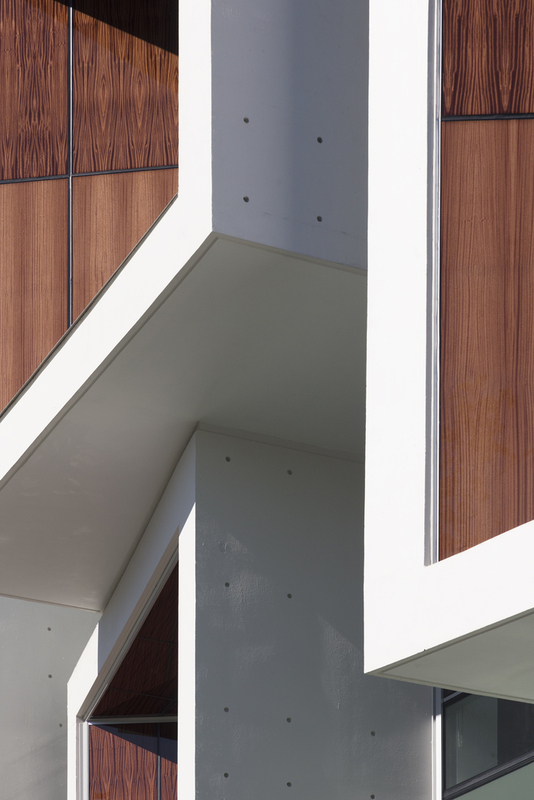 For example, the natural wood paneling incorporated within the design of the project will remain rich with its natural grain and colouring because it's been placed within two glass layers. Furthermore, reflective light also helps the animation of volumes within the water gardens and bamboo courtyards that divide the buildings. Aperture reminds me of the founding father of modern architecture- Le Corbusier's noteworthy approach to multi-residence homes- Unité D'Habitation mixed in with the windows that are reminiscent of the cubic aesthetic commonly associated with the Metabolist Movement. With his Unité D'Habitation, Le Corbusier aimed to create a multi-purpose apartment that touched base with all aspects of life, including social, retail and recreational spaces that were meant to connect a diverse community. Perhaps some of these aspects of unifying a community with its surrounding environment and people are present in Arno Matis Architecture's Aperture? Arno Matis Architecture creates a social and welcoming space within Oakridge's traditional single-family neighbourhood, including incorporating open social spaces for congregating in the complex. I applaud this firm's innovative design, their attention to detail, and how thoughtfully the complex bridges the otherwise disparate uses which surround it. 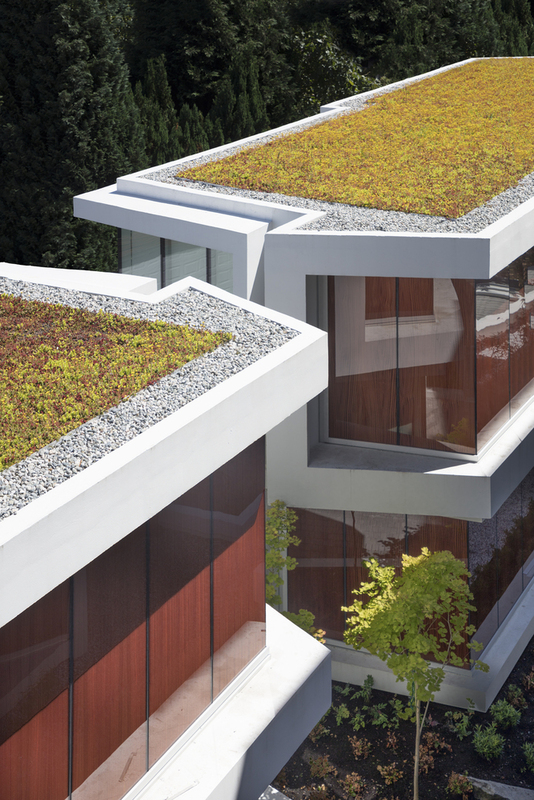 If you're as enticed by the architects at Arno Matis Architecture as I am, please visit their impressive portfolio!